There are dogs and then there are dogs. Those of you that have ever been blessed with the company of a dog understand that throughout a lifetime some of them stand out. Their personalities are a total fit and they form an unforgettable bond. Buddy was just such a dog. After 14 years of making us laugh almost every single day we had to say goodbye this past Saturday. It was difficult yet not unexpected. Buddy was our last family dog coming to us when my daughters were in junior high and high school. He was part of all of their circles of friends and enough of a character to remain in their memories even though they hadn’t seen him for years. He was the athlete, the clown and the sweetest animal I have ever known. He moved through the transition of a family of 4 to one of just 2 adults. He remained my youngest daughter’s best friend, she was his person. He was always part of coming home. I’m in the same camp as Jon Katz when it comes to the end of our dogs lives. I believe Buddy’s job was finished here and it was time for him to move on to the next. We have dogs come into our lives with just what we need at the time. They have a job. They are the ones that get us through particular trials and contribute to the joys we have in our lives. When their job is done they move on. I like to think of Buddy’s spirit moving on to another family where he can entertain kids and adults with his antics and loved for the gentle spirit that he was. We knew it was time on Friday and our vet came to the house Saturday afternoon. Buddy hated going to the vet more than any animal I have known and we wanted to do right by him. He died in Cait’s lap, his favorite spot for many, many years, giving us a peaceful closure so important to saying goodbye to someone you love. He will truly be missed. Taking care of an aging dog requires patience and an ability to stand back and look at your animal with a certain amount of detachment. There are many times when I wish they could talk, let me know how you’re feeling or what hurts. Buddy has been declining over the past couple of months. He had declined to the point of me finding a vet that would come to the house to put him down. Amanda and Cait were both here yesterday at the appointed hour. We waited with Buddy outdoors for the vet to arrive. When he did Buddy ran to him with enthusiasm (we haven’t seen him run in days, maybe weeks). He eagerly took treats from the vets hand, patiently waited through the exam, cheerfully sat with us all while we discussed his fate. This new vet, what I can only describe as a classic country vet, arrived in his Prius and removed his bags to the driveway. As Buddy barked and wagged his stumpy tail we all introduced ourselves and talked about what we had seen happening in the past couple of weeks. He listened to his heart and lungs, felt the lumps all over his body, checked out his legs and feet (he’d recently broken a nail and had been limping badly – this was a case of adding insult to injury). It started to rain so we all went into the shop and used a woodworking bench as an examination table. His recommendation was to do a few tests to check his kidney function, thyroid function and rule out things like Lyme and Cushing’s disease. With his symptoms we all decided to rule out things that could be resolved easily with minimal intervention. The vet’s opinion was that Buddy probably had a little more life left in him. I have to tell you that we were wrecks at the thought of losing Buddy. It’s never an easy decision to make. You think about his life, the dog he was and the hole it is going to make in your life. At the same time it’s just as difficult to watch a once vibrant, active dog struggle for a breath, whine in what seems to be pain, refuse to go for his favorite walks. As Amanda said – he made us look like fools for thinking he was too sick to go on. This is the first time in decades that I have had a veterinarian that I felt had the best interest of my animal at heart. He was objective, said flat-out that being in the position of deciding an animals fate is the most uncomfortable position he finds himself in. He answered all of our questions and said he would only check him for things that were easy to deal with. In other words he wasn’t going to recommend dialysis, chemo or heart intervention. This is something the vets that have seen Buddy over the years would probably not hesitate to offer. Animal medicine has become a close relative to the medical system we all deal with in this day and age. I always feel it’s all about the money, whatever it takes. For Buddy this was the best possible scenario, he was thoroughly checked out, in his own environment by a really nice guy with treats. As the doc readied to leave he took the two vials of blood and placed them into the centrifuge on the floor on the passenger side. Plugged into the lighter socket it quietly spun. He assured me he’d call today with the results and with an idea of where we go from here. I thought to myself that this is the kind of thing that makes me so happy to be here. This is what makes living in a rural area work. The people around you get it. They do their jobs with the understanding and sensibilities that we have grown up with far from the influences of urban life. Snow on Sunday. Snowing again today. Nothing has really accumulated but it’s here. It’s been quite cold the past week or so, cold enough to break out the winter coat. This time of year is the most difficult for me in a lot of ways. The days are so much shorter. The house is cold a lot of the time. I know this is one long, long slog until spring. We are talking 5 months minimum on the hill. Yes, we will have a few of those January thaw days and it will warm up in April so we think we can actually do something outside in the garden but . . . never, ever plant anything before Memorial Day. So what are the advantages of a long, dark winter? For me it gives me time to work on many different projects. I have a lot of handwork that sits idle whenever the weather is good enough for me to be outdoors. It’s a time for woodfires in both stoves and fireplaces. I love hearth cooking and that is really only fun when it’s really cold out. If I sit and watch a movie on TV that’s okay – I’m not frittering away a day when there is too much else to be done. Did I mention weaving? Weaving, weaving, weaving, nothing more to be said about that. I love the beauty of the snow on the trees and ground, how bright it is with the moon shining. I love the sound of the snow under your feet on those cold, quiet nights with a million stars visible from the driveway. I love snoeshowing the property lines, it gives me a wider perspective of the land (and I can walk on all those wet, swampy spots that I can’t cross any other time of the year). There is bird song of a whole different kind. So it’s now time to ease into a slower pace, enjoy family and friends and work on things left since last winter. This is what the dogs live for. You should all be happy this is a still and not video. This is the kind of attention you get when you pick up the squeaker that has recently been removed from a toy and use it for your own entertainment. Even the dog that HATES squeakers was in for the game. It was more powerful than food. No one got it in the end – it was for my entertainment only. No dogs were harmed in the making of this photograph. I have a few combination pots of herbs that have (had) cherry tomato plants in them. I have had tomato blight this year in a big way so the tomatoes are on some very sad looking vines. 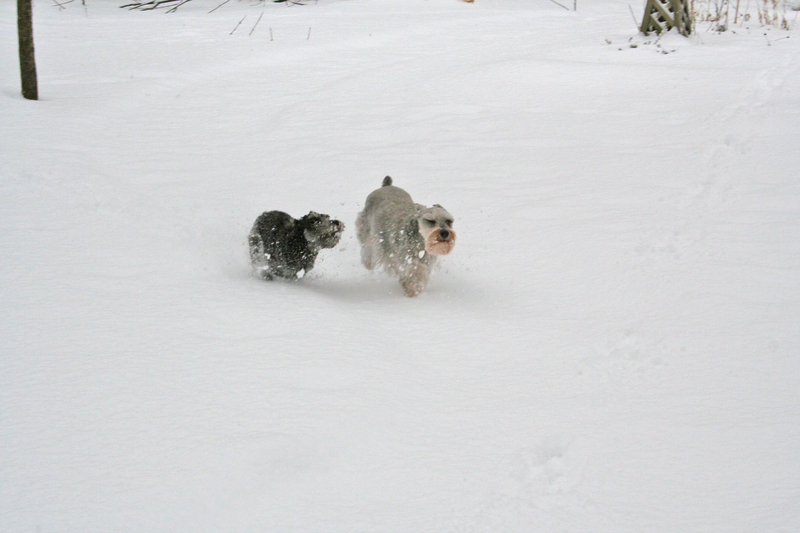 Years ago, when I had only one dog, it was a little schnauzer named Holly. She was completely food obsessed. Each year I planted a pot of cherry tomatoes in my back yard in Enfield so I would pick one for her every time we went out. She loved it and her first stop in the yard was that pot. Buddy came along and she showed him the trick. Years have gone by and I no longer have tomatoes in Enfield. Buddy is getting on in years and we think he has a little dementia (which dogs actually do get). This is what we saw him doing Sunday night. He was picking the tomatoes off of the vines in the pots in the yard. He’s hard of hearing so was unaware of me being behind him with the camera, he was totally concentrating on eating tomatoes. We all had a little chuckle about this finding it interesting that so many years have passed since he actually did this. The day was beautiful and we cooked and ate outdoors. As we were sitting down to eat Bill looked over to the garden where Buddy was showing Chester the ropes in tomato eating in my tomato patch. One yell and Chester made a beeline out of the place he knows he’s not supposed to be. Buddy? He had to have at least one more before he left. It’s snowing again, although I’m not sure how much accumulation we will get. I have to say that it’s hard to be too disgruntled about snowy weather when your dogs love nothing more than the back yard being a winter wonderland.